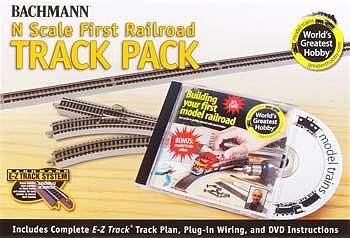 This is the World's Greatest Hobby N Scale First Railroad Track Pack by Bachmann. Suitable for Ages 14 & Older. Retail $265.00 SAVE 37% ! E-Z Track track plan included to build a 56" x 28" layout. Nickel silver rails for superior electric conductivity. Modeled from AAR track engineering dimensions. Building Your First Model Railroad DVD, hosted by actor/mode railroader Michael Gross. This helped in adding to my starter set by Bachmann. This product was a lot pricier from other suppliers.